Phospho Glow is for those times when you want to shine! 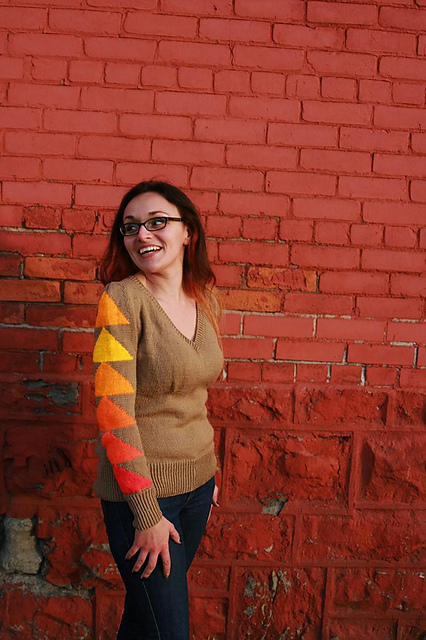 With a bright gradient of intarsia running up each sleeve, this knit is designed to be eye catching. The feminine details of waist shaping at the small of the back and bust shaping across the front create a knit that is very comfortable to wear. The slightly puffed sleeves add some extra drama, making this a sweater that’s unforgettable. Choose the size that is within +/- 2” of your actual bust measurement. Phospho Glow is designed to have 1” of positive ease. This garment is intended to fit with 1” of positive ease. This means that you should choose a size that’s within +/- 2” of your actual bust measurement. Sizes listed above are finished garment measurements. Please see the Garment Schematic for a list of garment measurements to best inform your size choice. On each sleeve, you have room for 6 (6, 6, 6)(6, 7, 7) triangles. DO NOT begin another triangle unless you have accounted for a different row gauge than listed in the pattern.